Beschermende accumat - neuraliseerd zuur die vrijkomt van uw accu en verdijft vocht. Knip de accumat op maat. Bij voorkeur zodanig dat tenminste 3 mm uitsteekt naat alle zijden vanonder de accu. Your car is at risk - from its own battery. An acid leak causes untold damage from corrosion. The battery mat neutralises any acid spilled and repels moisture, consequently keeping the area under and around your battery clean dry and corrosion free. 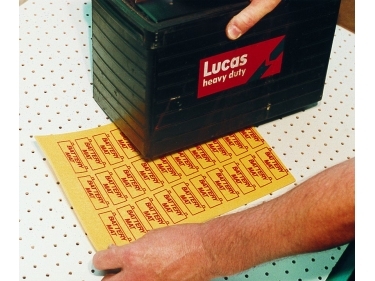 Battery Mat is 20cm x 30cm. 1) The battery mat should be cut to a size that will provide a skirt area of approximately 1/8 inch on each side of your battery. To determine the proper size for your battery mat measure the length and width of your battery and add 1/4" to the length and width figures. For example, assume your battery is 6-1.4 inch wide and 10-1/4 inch long. Adding 1/4 inch to each measurement will yield the new figures of 6-1/2 inches in width and 10-1/2 inches in length. 2) Using a pair of scissors cut the battery mat to the dimensions you determined in step 1. Discard the leftover portion of the battery mat. 3) Unbolt and remove the battery's "hold-down clamp". The hold-down clamp might be on the topside of the battery or it may be located at the base of the battery. 4) With the clamp removed, raise the battery enough to place the battery mat directly under your battery. 5) After making certain that the battery is replaced in its proper location, reposition and secure the battery clamp.